I watched Andrew pour waffle batter in the hotel lobby. Had it really been a year since we made them at home? Time to take a second look in the appliance cabinet. The kids and I measured ingredients for Sue Gregg's blender batter waffle recipe and dusted off the machine for morning. I failed to explain the concept of an assembly line. We ended up giggling over I Love Lucy's chocolate factory on YouTube instead. I'd say we squeezed the last drop of batter from this experience! Fun family prep, a delicious breakfast, a new skill for the kids, and a stack of healthy waffles in the freezer. Conclusion: the waffle maker earns its keep! Meredith, I am *all about* bringing kids into the kitchen! I love this and love your good-natured forbearance when it comes to the mess and mayhem that can result. As parents, we owe it to our children to fill them to the brim with skills and internal resources so that they are less vulnerable to the forces that don't have their best interests at heart. Kudos for this! My waffle iron died a terrible death a while back. For the time being we're thrown back to pancakes instead but enjoying making different shapes. What a fun photo! Great morning experience! Loved the waffle artwork too! WE LOVE WAFFLES, BUT ALAS, DON'T MAKE THEM AS OFTEN AS WE SHOULD. LOVE THE FACTORY SIGN! Nope, this is an odd Spode dish from Goodwill. Though I was sorely tempted by a set of dishes at Dillard's, I resisted! Good for you! I just found Sue Gregg's recipes. We are starting to soak our flour and sprout our grains/seeds. Awesome to see others doing it too! We enjoy our belgian waffle maker. I have even used it as a "panini" press, too. I have a Hello Kitty waffle maker I got a Target for #5. You have inspired me to finally use it! Perhaps we'll have breakfast for dinner! In my fondest dreams I'd love to have a flipping waffle maker station like the hotels do. We make do with an assembly line collection of assorted yard-sale models, so somewhat faster, even though they cook at different speeds. It's a mess, even with teens. One of the first posts I remember reading at LikeMerchantShips was about the Sue Gregg blender-brown rice-batter, and knew we were on the same wave length. But surely that was longer than a year ago! 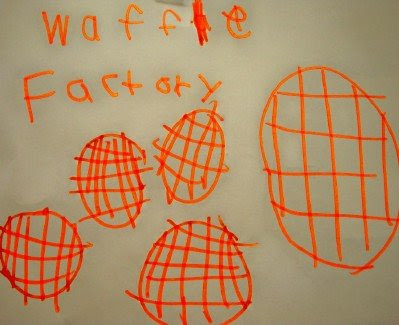 The kids love waffles; I don't like what I read on the labels. Found a very easy whole wheat recipe here: http://www.countrylivinggrainmills.com/index.php?action=recipes&recipe=waffles.php which makes 14 waffles (7 sets of two), taste good and can be frozen! And I really want one of those cool waffle makers that the hotel has, as well. We love waffle makers here...so fun! 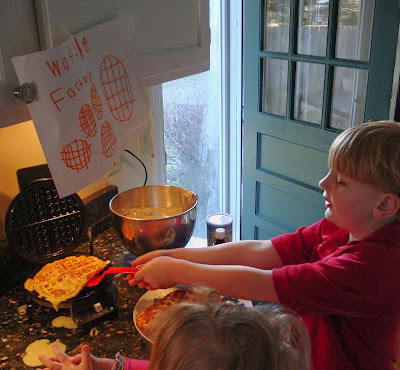 Waffles are a Saturday morning ritual at our house - Daddy makes the whole wheat batter! Best of all, he sneaks in chocolate chips - no syrup required! We've been making waffles on an almost weekly basis here. They are yummy, cheap, and so much healthier than frozen. We also cook frozen strawberries and sugar with a little bit of orange juice and flour (or cornstarch) on the stove for the sauce. So good! I was just telling myself today that I have to get it out. It's not been a year for me, but a few weeks. I make them up in big batches, freeze them and 9 times out of 10, that is what my oldest daughter wants to eat for breakfast on school days. I use a recipe that you separate the eggs and then whip the whites until you get stiff peaks and then fold it into the batter. Oh is it ever crisp on the outside and so soft on the inside. They are so good I just butter them and then eat them with coffee like toast. This is truly good to know as I have always wondered about Waffle Makers...and it seems as though they are worth is, as you said! We love our waffle maker; it is the most used appliance in the house! And waffles are a very easy to make gluten-free, which is a plus for us. oh, waffles (home made!) are a main staple in our home! love the pix. your back door is open ? ? ? Cute! Any time the kids can participate is a *good* time! And in this case, yummy, too! We couldn't live without our wafflemaker. My mother gave me hers when my finally gave up the ghost a few months back. 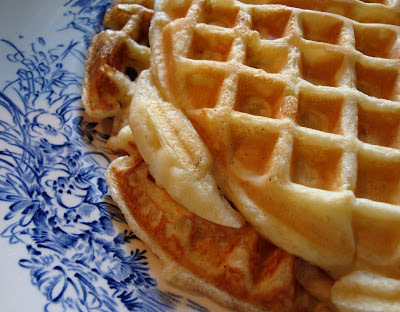 We whip up huge batches of batter and make waffles and freeze them. Pop them in the toaster to heat them up and voila' instant toaster waffles. We absolutely love it! Hi there, I found your blog through the Scholastic contest and love it! We made the waffles the other morning (left the blender of batter out on the counter overnight as directed) and found the batter to be very thin; the waffles took a long time to cook and the texture seemed a little off. Do you have any tips on the recipe? I am very intrigued by the recipe and want to try and get it right! A lot depends on the type of grains--I use wheat berries and oats. I have not had a lot of success with rice or barley. Mine taste pretty much like the Van's whole grain waffles you can buy frozen in the organic section of the grocery. Meredith, thank you so much for responding and for stopping by our blog! Great to meet you. I did use rice in the waffles, so that may have been the problem. I will check out the link you posted. We also do not have a full-sun area inside our small yard for growing veggies, so I'm hoping the planter boxes in the alley will do the trick. We got a discount on them because we chose wood that was imperfect (holes, nicks, etc.) but they were still a bit pricey. Hopefully we'll be able to grow tons of stuff in them this year. I need a better waffle maker. I like those circles. Mine is too big and the batter never even makes it all the way to the edges! Love the factory! Ready to forge into new territory? Try using your waffle maker for grilled cheese or pbj sandwiches and there are several cookie recipes for the waffle maker too.